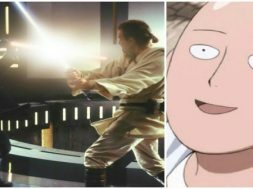 In a world swarmed with superhero movies, One Punch Man is an anime which takes on the tropes of a superhero franchise and completely turns it on its head. This makes the anime reach a level of satirical commentary that raises One Punch Man as one of my favourites. One benefit of One Punch Man making such an impact (pun intended) is because of the powerful animation from Arifumi Imai. Imai has worked on other popular animes, including Naturo and Attack on Titan. So what do you think happens when an animator like Imai takes on one of the coolest lightsaber fights in the Star Wars franchises and makes it his own? Well, you get something pretty awesome, that’s what! The fight scene between Obi-Wan Kenobi and Darth Maul in Star Wars: The Phantom Menace is arguably one of the best things about the film. Imai must think the same, because on Twitter, Imai posted a short animated gif of his own design showing a rough draft of this fight sequence. Check it out below! One can only hope he’ll get around to animating the rest of the sequence!